Earlier this year at the international quilt show in Malvern, my quilt entitled ‘Stars in the Night ‘from a design by Jaqueline De Jong, caught the attention of the judges who awarded it with a Judges Merit Rosette. It is a foundation pieced quilt and machine quilted with a feather design in metallic threads in the dark sky areas. Difficult to see the detail in the photos. I was thrilled and honoured to be selected for this award, given the number of very talented people across the country, who are producing exceptional work. I committed a great deal of time and energy to this project, which is the first piece of work I have ever entered into a competition; the award has made it all worth while and will encourage me to do more. When I returned to the UK 3 years ago having retired, I joined a patchwork group in the town where I had grown up. Several of the members were people I had been to school with, so in a sense this new association completed a circle within my life. Their warm welcome gave me the confidence to develop my skills to the point at which I felt ready to enter a piece of work in a national competition. What excites me about this medium is the way in which it calls on your creativity through the selection of shapes and colours and their integration into an overall design to create a piece of art, no less than a painting or a piece of sculpture. Interest in the medium has been stimulated this year by the patchwork exhibition at the V and A Museum in London. 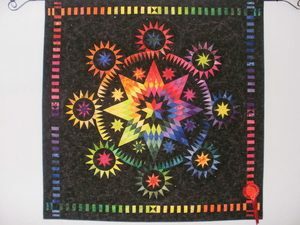 Many people are taking up Patchwork and Quilting as a means of expressing their creativity, while at the same time enjoying the social aspect of membership of community quilting groups. I had the honour of becoming the Chairlady of our group this year and feel very fortunate indeed to have found a ‘home’ in the fellowship of other enthusiasts.